Fluid is a great Mac app that converts any specified web site into it’s own self-contained application, allowing you to do things like turn Gmail, Facebook, Wikipedia, Soundcloud, and Pandora, into their own dedicated app. Other than being useful for creating apps exclusively for particular websites, Fluid is also great for those of us who are easily distracted by other things on the web, forcing the usage of only the given site. The web apps are self contained versions of the website, which makes it nice if you want to avoid distractions, and for many other purposes. The default app icon comes from the favicon, or the Apple Touch Icon if the site has one. Give it a try, it’s pretty neat. Fluid is free to download and use. For those who want extra features, a paid version is available for $4.99 that allows for separate cookie storage, pinning apps to the status bar, scripting support, and the ability to use OS X’s Full Screen App mode. This would be a great app for parental controls too, create individual apps for websites that are allowed, then disallow access to Safari, Chrome, etc. the only problem with that idea is that Fluid simply puts a webpage in it’s own window. You can then just type another URL into it and go to the page just like any other browser window. While reading this article and watching the video on the apps website, I was wondering how the menus of a Fluid App look like. I can’t find any information about this. 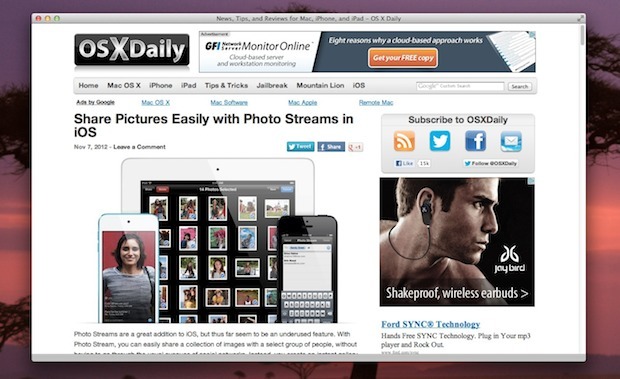 Do Fluid Apps just use the same menu bar as Safari? You say you can just enter another URL, but where do you enter this URL? There’s no address bar. 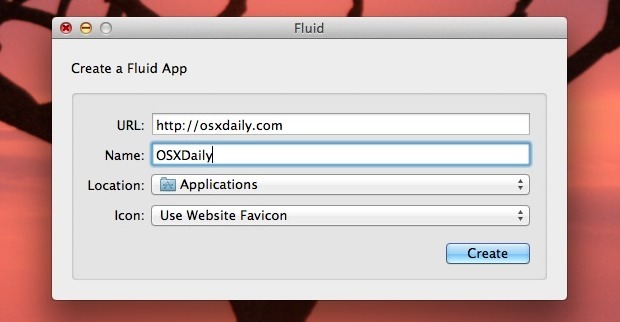 Do Fluid Apps just use the same menu bar as Safari, so you can just click on “File” and then click on “Open location” to enter a URL. How about short cuts? Can you just press Cmd + T to open a second tab and show the tab bar? Heard this trick on an InfoSecurity podcast: if you’re concerned about Facebook tracking your identity all over the web (which they can do with embedded LIKE buttons on sites which act as trackers) then get the Fluid upgrade and make a Facebook ‘app’ (and delete your Facebook cookies from your normal browsers). That’s the reason I purchased fluid. So that FB and others do not track. I found it too many times Home Depot and Sears emails were right on the spot trying to help me with what I was googling. I have the licensed version. So do I still need to delete all the FB cookies all the time or can I del my browser history once and be cool after? Same here any update to fix this? Notifications don’t work in paid version as promised and support is non-existent. Otherwise, great to have for gmail, gcal and other often used sites. Sounds interesting, and very useful for a specific-demographic website like mine. I’ll try it and see what happens – better make a new improved favicon first though. Fluid can use Chrome instead of Safari as browser engine? Please check Mozilla license, this appears to be a copy of prizm or prism application Mozilla developed a couple years ago. I don’t know if the author can legally charge for this app. This is not a copy of Prism. The developer says on their site that Fluid was inspired by Prism, so at least they give credit. I have a Mac Mini as a HTPC, and use Plex. Recently, I “had it” with the constant issues with the Netflix Plug-in on Plex. So I turned to Fluid and made a stand alone app. The benefit? I can put that in my dock, and from a 10′ UI perspective, using Hippo Remote from my phone I can get into Netflix quickly and reliably. Nice! I use fluid frequently, but after Apple switched to making user download java directly from Oracle, the Fluid apps I made that make use of java have been broken. I hope they get around to fixing it.